Many of us feel overwhelmed and ill-equipped to deal with our personal finances. We wonder if we will ever experience financial freedom. We want to make wise decisions and spend money on what matters, but we just don't know how. Financial advisor Emily G. Stroud is a mom, businesswoman, and entrepreneur. She has two decades of experience with helping people make smart choices about money. She knows that money can be one of the great causes of stress in life-but that it doesn't have to be that way. Finances, in fact, can be a great source of joy, security, and hope. 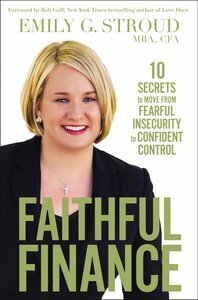 About "Faithful Finance: 10 Secrets to Move From Fearful Insecurity to Confident Control"